Milwaukee BizTimes (Formerly the Small Business Times) is Southeastern Wisconsin's source for news and information for the business community. 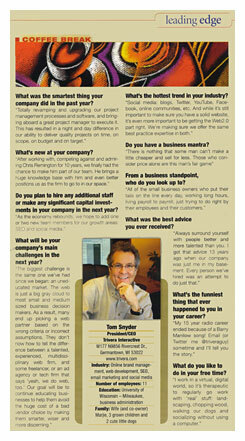 So Trivera was honored when they chose to profile founder, president and CEO Tom Snyder as the featured local executive in their Coffee Break column. In addition to lots of great insight into what makes Trivera tick, there's also an unanswered question: What's the funniest thing that ever happened in your career? A lot of people tweeted me to ask about my answer. I tried really hard to put this 140 characters... no luck. Yes. I was fired over a Barry Manilow song. I was actually a very successful DJ (used the name Tom McCarthy on the air) and music director at WLTQ and Star 95 back in the late 80's. As Program director at EZ-Listening WEZW, we had a General Manager that just didn't get a "love-songs" format. Despite huge ratings, he was constantly questioning what we were playing. He would even call the request line from his car with "traffic reports" when I was on the air, but then would also ask me why we were playing the song that was on that moment. One day he came into my office and demanded that I justify the fact that we were playing a particular Barry Manilow song. I must have been having bad day, because I brought up the song on our music scheduling system, and gave him a single keystroke that would eliminate that song on his station forever. It probably wasn't so much a Barry Manilow song that cost me my job, as much as it was telling my boss to "just come over here, delete the %#$*& Barry Manilow song, and get out of my office." He hit the delete button, then went straight to his office and called corporate to give him permission to delete me too. The episode got me out of radio, into the broadcast software business, and eventually, into Web. While I loved that business, in retrospect it was the best thing that ever happened to me. I'm much happier doing what I'm doing now, and just listening to the radio while I work.